This past Friday, Avon Sail House hosted a shop party celebrating the Hatteras spring windsurfing season, and Hatteras Wave Jam 2009! 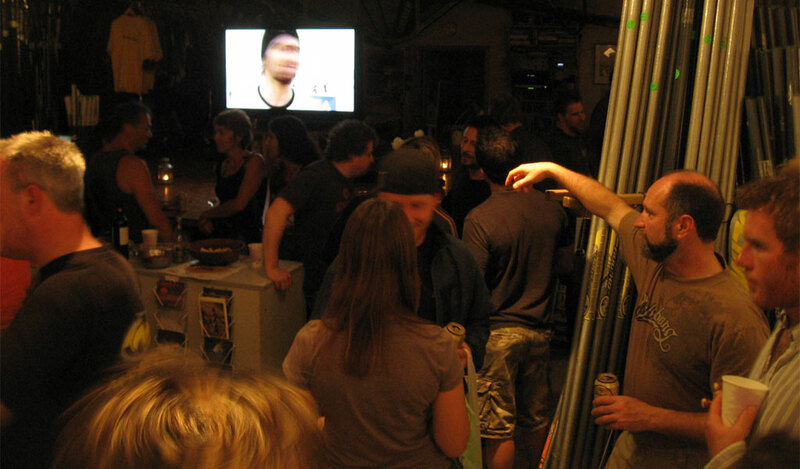 The party was a packed house with lots of drink, food, and video entertainment run on Jim M's giant 50+ inch plasma TV. One of the featured videos was a new compilation title "Hatteras Extreme" which showcases some of the big stuff experienced over the past few years. In other NC windsurfing news, we all wish to congratulate Scott Burnside from southern coastal NC (Wrightsville to Carolina and Kure beaches) for sticking his first FWD loop!! I received an email from him late last week noting that he successfully stuck the landing, and caught it on GoPro video during a recent sesh at Wrightsville Beach! Check out his video of FWD Loop success! Nice work on the slide show. The music adds to the fun. yup-very nice Bill. got me STOKED UP! 16 days till the jammer loop off event. man i cant wait!